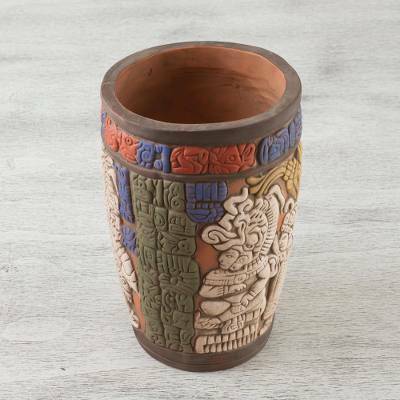 Hand Crafted Archaeology Museum Replica Ceramic Vase, "Maya King of Tikal"
Angel Cerón crafts an exquisite museum replica in ceramic. The vase bears images from the Maya city of Tikal. Depicted in the style of the classic era, a ruler sits on a throne while standing guardians hold scepters or rods, symbolizing authority. Rows of polychrome glyphs commemorate an important event in the history of this sophisticated civilization. 21 cm H x 14 cm Diam. 8.25" H x 5.5" Diam.